Public comment period opens on proposed revision to existing special regulation for Off-Road Vehicle use at Cape Hatteras National Seashore. A nesting sea turtle was found severely injured on Cape Hatteras National Seashore beach. The National Park Service invites all visitors and residents to attend our Night Sky Appreciation Event on August 25, 2016 at the Ocracoke Lifeguard Beach. Thursday, August 25, 2016 is National Park Service Founders Day and the 100th anniversary of the establishment of the National Park Service! Sea turtle nesting record surpassed at Cape Hatteras National Seashore this year. 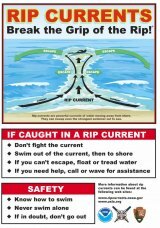 Cape Hatteras National Seashore wishes to remind the public of the dangers that rip currents pose to visitors along the Seashore. Two swimming-related fatalities have occurred off Cape Hatteras National Seashore beaches over the last two days. NPS offers sea turtle nest excavation programs in August and September. Two men were caught in a rip current; one did not survive. Learn how to take better photos at Ocracoke's most beautiful places.